Vodafone has today started to accept pre-orders for the 4G-ready Sony Xperia Z smartphone, expected to launch in the UK at the end of this month. The network says that the 5-inch, 1080p handset is equipped to work on its 4G LTE network when the roll-out begins for Vodafone customers sometime later in the year, following the Ofcom spectrum auction. Vodafone is offering the impressive handset for free on a £42 a month, 24 month contract, with unlimited texts, minutes and 2GB of mobile data. Contracts further down the trough offer £29, £33 and £37 a month contracts over two years, but users will have to pay £149, £99 and £49 (respectively) as a one-off fee for the Android Jelly Bean 4.1 handset. As an added bonus, the first 1,000 customers to order before the February 28 - the expected, but unconfirmed launch date - will get a free pair of Sony MDR-1R headphones. 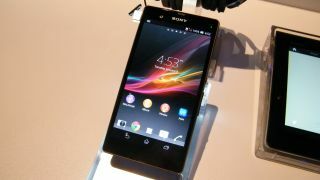 The Sony Xperia Z was a big hit during its launch at CES and "impressed us hugely" during our hands-on review posted during the event. With a 5-inch, full HD 1080p Bravia-infused screen, complete with the highest pixel density of any smartphone to date, it looks like Sony is onto a real winner. Alongside the company's premium design ethic, there's plenty of power, top-notch imaging tech and the addition of waterproof and dustproof casing. It's an early front-runner to challenge the very best smartphones of 2013. Check back for TechRadar's in-depth review of the device in the next few days.